OVN – Geneve vs VXLAN, Does it Matter? One of the early design decisions made in OVN was to only support tunnel encapsulation protocols that provided the ability to include additional metadata beyond what fits in the VNI field of a VXLAN header. OVN mostly uses the Geneve protocol and only uses VXLAN for integration with TOR switches that support the hardware_vtep OVSDB schema to use as L2 gateways between logical and physical networks. Many people wonder when they first learn of this design decision, “why not VXLAN?” In particular, what about performance? Some hardware has VXLAN offload capabilities. Are we going to suffer a performance hit when using Geneve? These are very good questions, so I set off to come up with a good answer. One of the key implementation details of OVN is Logical Flows. Instead of programming new features using OpenFlow, we primarily use Logical Flows. This makes feature development easier because we don’t have to worry about the physical location of resources on the network when writing flows. We are able to write flows as if the entire deployment was one giant switch instead of 10s, 100s, or 1000s of switches. Part of the implementation of this is that in addition to passing a network ID over a tunnel, we also pass IDs for the logical source and destination ports. With Geneve, OVN will identify the network using the VNI field and will use an additional 32-bit TLV to specify both the source and destination logical ports. Of course, by using an extensible protocol, we also have the capability to add more metadata for advanced features in the future. More detail about OVN’s use of Geneve TLVs can be found in the “Tunnel Encapsulations” sub-section of “Design Decisions” in the OVN Architecture document. There are many more NIC capabilities than what’s discussed here, but I’ll focus on some key features related to tunnel performance. Some offload capabilities are not actually VXLAN specific. For example, the commonly referred to “tx-udp_tnl-segmentation” offload applies to both VXLAN and Geneve. This is where the kernel is able to send a large amount of data to the NIC at once and the NIC breaks it up into TCP segments and then adds both the inner and outer headers. The performance boost comes from not having to do the same thing in software. This offload helps significantly with TCP throughput over a tunnel. There is a type of offload that is VXLAN specific, and that is RSS (Receive Side Scaling). This is when the NIC is able to look inside a tunnel to identify the inner flows and efficiently distribute them among multiple receive queues (to be processed across multiple CPUs). Without this capability, a VXLAN tunnel looks like a single stream and will go into a single receive queue. You may wonder, “does my NIC support VXLAN or Geneve RSS?” Unfortunately, there does not appear to be an easy way to check this with a command. The best method I’ve seen is to read the driver source code or dig through vendor documentation. Since the VXLAN specific offload capability is on the receive side, it’s important to look at what other techniques can be used to improve receive side performance. One such option is RPS (Receive Packet Steering). RPS is the same concept as RSS, but done in software. Packets are distributed among CPUs in software before fully processing them. Another optimization is that OVN enables UDP checksums on Geneve tunnels by default. Adding this checksum actually improves performance on the receive side. This is because of some more recent optimizations implemented in the kernel. When a Geneve packet is received, this outer UDP checksum will be verified by the NIC. This checksum verification will be reported to the kernel. Since the outer UDP checksum has been verified, the kernel uses this fact to skip having to calculate and verify any checksums of the inner packet. Without enabling the outer UDP checksum and letting the NIC verify it, the kernel is doing more checksum calculation in software. It’s expected that this regains significant performance on the receive side. In the last section, we identified that there is an offload capability (RSS) that is VXLAN specific. Some NICs support RSS for VXLAN and Geneve, some for VXLAN only, and others don’t support it at all. This raises an important question: On systems with NICs that do RSS for VXLAN only, can we match performance with Geneve? On the surface, we expect Geneve performance to be worse. However, because of other optimizations, we really need to check to see how much RSS helps. After some investigation of driver source code (Thanks, Lance Richardson! ), we found that the following drivers had RSS support for VXLAN, but not Geneve. To help answer our question above, we did some testing on machines with one of these NICs. The testing was done between two servers. Both had a Mellanox NIC using the mlx4_en driver. The NICs were connected back-to-back. Used a newer kernel to ensure we had the latest optimizations available. Create two tunnels between the hosts: one VXLAN and one Geneve. With Geneve, add 1 TLV field to match the amount of additional metadata sent across the tunnel with OVN. All tests are run 3 times. Results must be within 5% stddev or the 3 runs will be discarded and will run again. This ensures reasonably consistent and reliable results. We reach line rate with both VXLAN and Geneve. Differences are observed in CPU consumption where we see Geneve consistently using less CPU. We see higher CPU usage in these scenarios with Geneve, but an even higher relative amount of requests per second processed, leading us to conclude that Geneve is performing better overall in this case, as well. Using optimizations available in newer versions of the Linux kernel, we are seeing better performance with Geneve than VXLAN, despite this hardware having some VXLAN specific offload capabilities. Based on these results, I feel that OVN’s reliance on Geneve as its standard tunneling protocol is acceptable. It provides additional capabilities while maintaining good performance, even on hardware that has VXLAN specific RSS support. Adding general VXLAN support to OVN would not be trivial and would introduce a significant ongoing maintenance burden. Testing done so far does not justify that cost. We have done a lot of performance testing of OVN over time, but one major thing missing has been an apples-to-apples comparison with the current OVS-based OpenStack Neutron backend (ML2+OVS). I’ve been working with a group of people to compare the two OpenStack Neutron backends. This is the first piece of those results: the control plane. Later posts will discuss data plane performance. 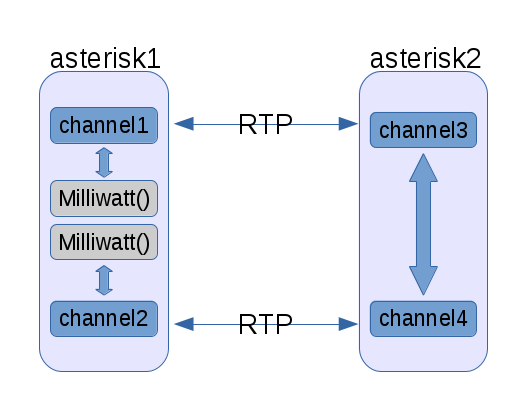 The ML2+OVS control plane is based on a pattern seen throughout OpenStack. There is a series of agents written in Python. The Neutron server communicates with these agents using an rpc mechanism built on top of AMQP (RabbitMQ in most deployments, including our tests). OVN takes a distributed database-driven approach. Configuration and state is managed through two databases: the OVN northbound and southbound databases. These databases are currently based on OVSDB. Instead of receiving updates via RPC, components are watching relevant portions of the database for changes and applying them locally. More detail about these components can be found in my post about the first release of OVN, or even more detail is in the ovn-architecture document. OVN does not make use of any of the Neutron agents. Instead, all required functionality is implemented by ovn-controller and OVS flows. This includes things like security groups, DHCP, L3 routing, and NAT. This configuration defines several scenarios to run. Each one is set to run 500 times, at three different concurrency levels. Finally, “rerun: 3” at the beginning says we run the entire configuration 3 times. This is a bit confusing, so let’s look at one example. In total, we will have created 4500 VMs. Browbeat includes the ability to store all rally test results in elastic search and then display them using Kibana. A live dashboard of these results is on elk.browbeatproject.org. The following tables show the results for the average times, 95th percentile, Maximum, and minimum times for all APIs executed throughout the test scenarios. The most drastic difference in results is for “nova.boot_server”. This is also the one piece of these tests that actually measures the time it takes to provision the network, and not just loading Neutron with configuration. When Nova boots a server, it blocks waiting for an event from Neutron indicating that a port is ready before it sets the server state to ACTIVE and powers on the VM. Both ML2+OVS and OVN implement this mechanism. Our test scenario measured the time it took for servers to become ACTIVE. Further tests were done on ML2+OVS and we were able to confirm that disabling this synchronization between Nova and Neutron brought the results back to being on par with the OVN results. This confirmed that the extra time was indeed spent waiting for Neutron to report that ports were ready. To be clear, you should not disable this synchronization. The only reason you can disable it is because not all Neutron backends support it (ML2+OVS and OVN both do). It was put in place to avoid a race condition. It ensures that the network is actually ready for use before booting a VM. The issue is how long it’s taking Neutron to provision the network for use. Further analysis is needed to break down where Neutron (ML2+OVS) is spending most of its time in the provisioning process. One of the most satisfying feelings when working on new software is when you settle on a really great abstraction. When this goes well, things just fall into place. The design is easy to understand and modifying the system is an easy, pleasant experience. This is how I’ve felt as I learned about the original proposed design for OVN and then contributed to OVN development over the last year and a half. In particular, I’ve been incredibly happy with the Logical Flows abstraction. In this post I’ll explain what Logical Flows are and how to use ovn-trace to understand them. I will also provide some examples where this abstraction made adding features far easier than I would have expected. Before getting to Logical Flows, it is helpful to have a general understanding of OpenFlow. OpenFlow is the protocol used to program the packet processing pipeline of Open vSwitch. It lets you define a series of tables with rules (flows) that contain a priority, match, and a set of actions. For each table, the highest priority (larger number is higher priority) flow that matches is executed. Let’s imagine a trivial virtual switch with two ports, port1 and port2. A trivial example is to define a single table where we forward all packets from port1 to port2, and all packets from port2 to port1. $ ovs-ofctl add-flow br-int "table=0, priority=0, in_port=1,actions=output:2"
$ ovs-ofctl add-flow br-int "table=0, priority=0, in_port=2,actions=output:1"
We can extend this example to add a second table and demonstrate the use of different priorities. Let’s only allow packets from port1 if the source MAC address is 00:00:00:00:01 and only allow packets from port2 with a source MAC address of 00:00:00:00:00:02 (basic source port security). We’ll use table 0 to implement port security and then use table 1 to decide the packet’s destination. Again, we can program this pipeline using the ovs-ofctl command line utility. $ ovs-ofctl add-flow br-int "table=0, priority=10, in_port=1,dl_src=00:00:00:00:00:01,actions=resubmit(,1)"
$ ovs-ofctl add-flow br-int "table=0, priority=10, in_port=2,dl_src=00:00:00:00:00:02,actions=resubmit(,1)"
$ ovs-ofctl add-flow br-int "table=0, priority=0, actions=drop"
$ ovs-ofctl add-flow br-int "table=1, priority=0, in_port=1,actions=output:2"
$ ovs-ofctl add-flow br-int "table=1, priority=0, in_port=2,actions=output:1"
Open vSwitch also provides a mechanism to trace a sample packet through a configured pipeline. Here we will trace a packet from port1 with an expected source MAC address. The output of this trace shows that the packet is resubmitted to table 1 and is then output to port 2. The output is a bit verbose. Just look at the “Rule” and “OpenFlow actions” lines to see which flows were executed. OpenFlow can be used to build up much more complex pipelines, as well. See the ovs-ofctl(8) man page for a lot more detail. The previous section recapped the basics of OpenFlow. It showed how OpenFlow can be used to build packet processing pipelines of a single switch. Manually programming these pipelines on one host, much less hundreds or thousands of hosts, can be tedious. That’s where an SDN controller that programs flows across many switches to accomplish a task is helpful. That’s the role that OVN plays for the Open vSwitch project. OVN does all of the OpenFlow programming necessary to implement the network topologies and security policies you define using its high level configuration interface. How does OVN determine the flows required on each host? The central abstraction to solving this problem in OVN is Logical Flows. Logical Flows are conceptually similar to OpenFlow in that they are made up of tables of flows with a priority, match, and actions. The major difference is that logical flows describe the detailed behavior of an entire network that can span any number of hosts. It provides us with separation between defining detailed network behavior and having to worry about the actual physical layout of the environment (how many hosts exist and which hosts ports reside on). OVN centrally programs networks in logical flows. These logical flows are distributed throughout the whole environment to ovn-controller running on each host. ovn-controller then knows how to compile logical flows into OpenFlow using the current state of the physical environment (what ports reside locally, and how to reach other hosts). Let’s create an example OVN configuration similar to the one in the section on OpenFlow basics. 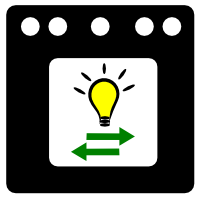 We will create a single OVN logical switch with two logical ports. OVN defines the logical switch, sw0, using two pipelines: an ingress pipeline and an egress pipeline. When a packet enters the network, the ingress pipeline is executed on the host where the packet originated. If the destination is on the same host, the egress pipeline will be executed as well. If the destination is remote, the packet will be sent over a tunnel before executing the egress pipeline on the remote host. Ports are logical entities that reside somewhere on a network, not physical ports on a single switch. Each table in the pipeline is given a name in addition to its number. The name describes the purpose of that stage in the pipeline. The match syntax is far more flexible. It supports complex boolean expressions and will feel very familiar to programmers. The actions supported in OVN logical flows extend beyond what you would expect from OpenFlow. We are able to implement higher level features, such as DHCP, in the logical flow syntax. See the documentation for the Logical_Flow table in ovn-sb(5) for details on match and action syntax. There are several additional stages in the pipeline reserved for features not being used in this example, so the flows in many of the tables are not doing anything interesting. The easiest way to understand logical flows is to use the ovn-trace command. ovn-trace allows you to see how OVN would process a sample packet. DATAPATH identifies the logical datapath (a logical switch or a logical router) where the sample packet will begin. MICROFLOW describes the sample packet to be simulated. Much more detail can be found in the ovn-trace(8) man page. Given our sample OVN configuration, let’s see how OVN would process a packet from sw0-port1 that is intended for sw0-port2. ovn-trace has a few different levels of detail to choose from. The first is –minimal, which tells you what happens to a packet, but omits a lot of unnecessary detail. In this case, we see that the final result is that the packet will be delivered to sw0-port2, as expected. The packet enters the network (sw0) from port sw0-port1 and runs the ingress pipeline. We can see the value “sw0-port2” set to the “outport” variable, indicating that the intended destination for this packet is “sw0-port2”. The packet is output from the ingress pipeline, which brings it to the egress pipeline for “sw0” with the outport variable set to “sw0-port2”. The output action is executed in the egress pipeline, which outputs the packet to the current value of the “outport” variable, which is “sw0-port2”. While debugging a problem or modifying the code, you may want even more detailed output. ovn-trace has a –detailed option. In this case you get more details about each meaningful logical flow encountered. You see the table number, pipeline stage name, full match, and priority number from the flow. You also get a reference to the location in the OVN source code that is responsible for the creation of that logical flow. Another good example of using ovn-trace would be to see why a packet is getting dropped. We’ve enabled port security, so let’s get a detailed trace of what would happen to a packet sent from sw0-port1 that contained an unexpected source MAC address. The output will show us that the packet entered sw0 and failed to match any flow in table 0, meaning the packet is dropped. We also see that table 0 is named “ls_in_port_sec_l2”, short for “Logical Switch ingress L2 port security”. A similar example would be if a packet contained an unknown destination MAC address. In this case, we’ll see that the packet successfully passed table 0, but failed to match in table 13, “ls_in_l2_lkup”, short for “Logical Switch ingress L2 lookup”. So far, we have only looked at examples of a single L2 logical network. Let’s create a new environment that shows how ovn-trace works across multiple networks. 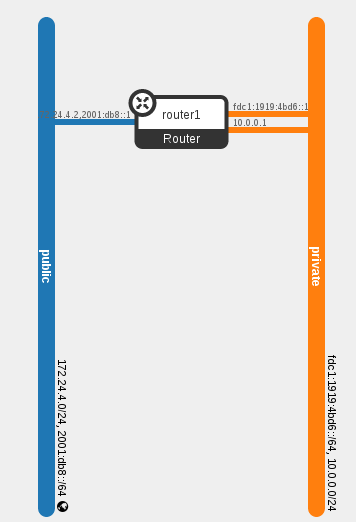 We will create 2 networks, each with 2 ports, and connect them with a logical router. # Create the first logical switch and its two ports. ovn-nbctl lsp-set-addresses sw0-port1 "00:00:00:00:00:01 10.0.0.51"
ovn-nbctl lsp-set-port-security sw0-port1 "00:00:00:00:00:01 10.0.0.51"
ovn-nbctl lsp-set-addresses sw0-port2 "00:00:00:00:00:02 10.0.0.52"
ovn-nbctl lsp-set-port-security sw0-port2 "00:00:00:00:00:02 10.0.0.52"
# Create the second logical switch and its two ports. ovn-nbctl lsp-set-addresses sw1-port1 "00:00:00:00:00:03 192.168.1.51"
ovn-nbctl lsp-set-port-security sw1-port1 "00:00:00:00:00:03 192.168.1.51"
ovn-nbctl lsp-set-addresses sw1-port2 "00:00:00:00:00:04 192.168.1.52"
ovn-nbctl lsp-set-port-security sw1-port2 "00:00:00:00:00:04 192.168.1.52"
# Create a logical router between sw0 and sw1. We can then use “ovn-nbctl show” to view the resulting logical network configuration. We should be able to trace a packet sent from sw0-port1 destined for sw1-port2, which requires going through the router. The minimal output will confirm that the end result is that the packet should be output to sw1-port2. We will also see what modifications the packet received along the way. As the packet traversed the logical router, the TTL was decremented and then the source and destination MAC addresses were updated for the next hop. If you’d like to take an even closer look, you can experiment with the previous ovn-trace command by changing the verbosity to –summary or –detailed. You could also start to make changes to the sample packet to see what would happen. I mentioned at the very beginning of this post that I find OVN Logical Flows to be a powerful abstraction that has made adding features to OVN much easier than I anticipated. Now that we’ve gone through logical flows in some detail, I’d like to point to a couple of recent feature developments that help demonstrate how easy logical flows make adding features to OVN. OVN has support for L3 gateways that can be used to provide connectivity between OVN logical networks and physical networks. A typical OVN network might have an L3 gateway that resides on a single host. The downside to using a single L3 gateway is that all traffic destined for that physical network must go through the single host where the L3 gateway resides. Recently, Gurucharan Shetty added support for multiple L3 gateways on an OVN logical network. The method supported for distributing traffic among the gateways is based on source IP address. It’s not important to understand all of the details in this change. I mainly want to draw attention to how little of a code change was required. Let’s take a look at the diffstat, organizied by the type of change. At the very core of this feature is the 24 lines of code changed in ovn-northd.c. This is where the code that generates logical flows was updated for this feature. That is amazing to me. This feature has a significant impact on network behavior, yet was accomplished in very few lines of C code. Another example of adding a feature using logical flows is this patch that adds support for setting the DSCP field of IP packets based on an arbitrary traffic classifier. The patch added a new QoS table to the OVN northbound database. In this table you define a match (or traffic classifier) and the corresponding DSCP value to set on packets that match this classifier. The key changes to the code are the 80 lines changed in ovn-northd.c. The patch looks a bit bigger than it really is because it created a new pipeline stage for QoS and had to renumber the stages that followed it. Implementing this feature using logical flows just requires inserting flows matching the configured match (traffic classifier), and then using the OVN logical flow actions “ip.dscp = VALUE; next;”. OVN supports DHCPv4 and DHCPv6, but all of the details are controlled through logical flows. In most cases, if behavior needs to be changed, it’s only a change to the code that generates the DHCP related logical flows. A recent example was this patch which added stateless DHCPv6 support. With stateless DHCPv6, we want to provide some configuration entries (such as a DNS address), but not assign an IPv6 address. Implementing this was just a small tweak to the DHCPv6 logical flows to optionally not include the IPv6 address option in the response generated by OVN. I hope you now have a better understanding of OVN Logical Flows, a match-action pipeline for defining the behavior of logical networks that can span many hosts. In January of 2015, the Open vSwitch team announced that they planned to start a new project within OVS called OVN (Open Virtual Network). The timing could not have been better for me as I was looking around for a new project. I dove in with a goal of figuring out whether OVN could be a promising next generation of Open vSwitch integration for OpenStack and have been contributing to it ever since. OVS 2.6.0 has now been released which includes the first non-experimental version of OVN. As a community we have also built integration with OpenStack, Docker, and Kubernetes. OVN is a system to support virtual network abstraction. OVN complements the existing capabilities of OVS to add native support for virtual network abstractions, such as virtual L2 and L3 overlays and security groups. Support for large scale deployments is a key goal of OVN. So far, we have seen physical deployments of several hundred nodes. We’ve also done some larger scale testing by simulating deployments of thousands of nodes using the ovn-scale-test project. OVN is a distributed system. There is a local SDN controller that runs on every host, called ovn-controller. All of the controllers are coordinated through the southbound database. There is also a centralized component, ovn-northd, that processes high level configuration placed in the northbound database. OVN’s architecture is discussed in detail in the ovn-architecture document. OVN uses databases for its control plane. One benefit is that scaling databases is a well understood problem. OVN currently makes use of ovsdb-server as its database. The use of ovsdb-server is particularly convenient within OVN as it introduces no new dependencies since ovsdb-server is already in use everywhere OVS is used. However, the project is also currently considering adding support for, or fully migrating to etcd v3, since v3 includes all of the features we wanted for our system. We have also found that this database driven architecture is much more reliable than RPC based approaches taken in other systems we have worked with. In OVN, each instance of ovn-controller is always working with a consistent snapshot of the database. It maintains a connection to the database and gets a feed of relevant updates as they occur. If connectivity is interrupted, ovn-controller will always catch back up to the latest consistent snapshot of the relevant database contents and process them. OVN introduces a new intermediary representation of the system’s configuration called logical flows. A typical centralized model would take the desired high level configuration, calculate the required physical flows for the environment, and program the switches on each node with those physical flows. OVN breaks this problem up into a couple of steps. It first calculates logical flows, which are similar to physical OpenFlow flows in their expressiveness, but operate only on logical entities. The logical flows for a given network are identical across the whole environment. These logical flows are then distributed to the local controller on each node, ovn-controller, which converts logical flows to physical flows. This means that some deployment-wide computation is done once and the node-specific computation is fully distributed and done local to the node it applies to. Logical flows have also proven to be powerful when it comes to implementing features. As we’ve built up support for new capabilities in the logical flow syntax, most features are now implemented at the logical flow layer, which is much easier to work with than physical flows. OVN implements features natively in OVS wherever possible. One such example is the implementation of security policies using OVS+conntrack integration. I wrote about this in more detail previously. This approach has led to significant data path performance improvements as compared to previous approaches. The other area this makes a huge impact is how OVN implements distributed L3 routing. Instead of combining OVS with several other layers of technology, we provide L3 routing purely with OVS flows. In addition to the performance benefits, we also find this to be much simpler than the alternative approaches that other projects have taken to build routing on top of OVS. Another benefit is that all of these features work with OVS+DPDK since we don’t rely on Linux kernel-specific features. Integration with OpenStack was developed in parallel with OVN itself. 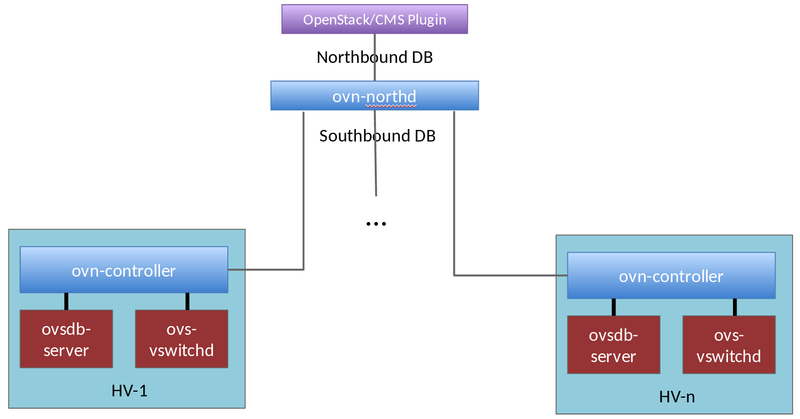 The OpenStack networking-ovn project contains an ML2 driver for OpenStack Neutron that provides integration with OVN. It differs from Neutron’s original OVS integration in some significant ways. It no longer makes use of the Neutron Python agents as all equivalent functionality has been moved into OVN. As a result, it no longer uses RabbitMQ. Neutron’s use of RabbitMQ for RPC has been replaced by OVN’s database driven control plane. The following diagram gives a visual representation of the architecture of Neutron using OVN. Even more detail can be found in our documented reference architecture. There are a few different ways to test out OVN integration with OpenStack. The most popular development environment for OpenStack is called DevStack. We provide integration with DevStack, including some instructions on how to do simple testing with DevStack. If you’re a Vagrant user, networking-ovn includes a vagrant setup for doing multi-node testing of OVN using DevStack. The OpenStack TripleO deployment project includes support for OVN as of the OpenStack Newton release. Finally, we also have manual installation instructions to help with integrating OVN into your own OpenStack environment. There is active development on a CNI plugin for OVN to be used with Kubernetes. One of the key goals for OVN was to have containers in mind from the beginning, and not just VMs. Some important features were added to OVN to help support this integration. For example, ovn-kubernetes makes use of OVN’s load balancing support, which is built on native load balancing support in OVS. The README in that repository contains an overview, as well as instructions on how to use it. There is also support for running an ovn-kubernetes environment using vagrant. There is OVN integration with Docker networking, as well. This currently resides in the main OVS repo, though it could be split out into its own repository in the future, similar to ovn-kubernetes. OVS and OVN are discussed on the OVS discuss mailing list. OVN development occurs on the OVS development mailing list. OVS and OVN are discussed in #openvswitch on the Freenode IRC network. Development of the OVN Kubernetes integration occurs on Github but can be discussed on either the Open vSwitch IRC channel or discuss mailing list. Integration of OVN with OpenStack is discussed in #openstack-neutron-ovn on Freenode, as well as the OpenStack development mailing list. When Ben Pfaff pushed the last of the changes needed to make OVN functional to the ovn branch, he dubbed it the “EZ Bake milestone”. The analogy is both humorous and somewhat accurate. We’ve reached the first functional milestone, which is quite exciting. In previous posts I have gone through and shown components of the system as it has been built. Now that it’s functional, I will go through a working demonstration of OpenStack using OVN. For this test environment we’ll stand up two hosts using DevStack. Both hosts will be VMs running Fedora 21 that have 2 vCPUs and 4 GB of RAM. We will refer to them as ovn-devstack-1 and ovn-devstack-2. Each VM needs to have git installed and a user created that has sudo access. This user will be used run DevStack. The first DevStack host will look like a typical single node DevStack install that runs all of OpenStack. It will be using OVN to provide L2 network connectivity instead of the default OVS ML2 driver and the neutron OVS agent. It will still make use of the L3 and DHCP agents from Neutron as the equivalent functionality has not yet been implemented in OVN. networking-ovn comes with some sample configuration files for DevStack. We can use the main sample for this host without any modifications needed. After the DevStack configuration is in place, run DevStack to set up the environment. 2015-05-13 18:59:48.169 | stack.sh completed in 989 seconds. The second DevStack host runs a minimal set of services needed to add an additional compute node (or hypervisor) to the existing DevStack environment. It needs to run the OpenStack nova-compute service for managing local VMs and ovn-controller to manage the local ovs configuration. Setting up the second DevStack host is a very similar process. Start by cloning DevStack and networking-ovn. networking-ovn provides an additional sample configuration file for DevStack that is intended to be used for adding additional compute nodes to an existing DevStack environment. You must set the SERVICE_HOST configuration variable in this file to be the IP address of the main DevStack host. Once the DevStack configuration is ready, you can run DevStack to set up the new compute node. It should take less time to complete than the first DevStack host. 2015-05-13 19:02:30.663 | stack.sh completed in 98 seconds. DevStack is now running on two hosts. Let’s take a look at the default state of this environment before we start creating VMs. We’ll run various OpenStack command line tools to interact with the OpenStack APIs. By default, these tools get credentials from environment variables. DevStack comes with a file called openrc that makes it easy to switch between admin (the cloud administrator) and demo (a regular cloud user) credentials. We can start by making sure that Nova sees two hypervisors. This API requires admin credentials. DevStack also has a default network configuration. We can use the neutron command line tool to list the default networks. The default environment also creates four Neutron ports. Three are related to the router and can be seen in the diagram above. The fourth (not shown) is for the DHCP agent providing DHCP services to the private network. These default networks and ports can also be seen in OVN. OVN has a northbound database (OVN_Northbound) that serves as the public interface to OVN. The Neutron driver updates this database to indicate the desired state. OVN comes with a command line utility, ovn-nbctl, which can be used to view or update the OVN_Northbound database. The show command gives a summary of the current configuration. Now that the environment is ready, we can start launching VMs. We will launch two VMs so that one will end up on each of our compute nodes. We’ll verify that the data path is working and then inspect what OVN has done to make it work. We want our VMs to have a single vNIC attached to the private Neutron network. DevStack automatically imports a very small test image, CirrOS, which suits our needs. We’ll use the m1.nano flavor, as minimal resources are sufficient for our testing with these VMs. We also need to create an SSH keypair for logging in to the VMs we create. We now have everything needed to boot some VMs. We’ll create two of them, named test1 and test2. We can use admin credentials to see which hypervisor each VM ended up on. This is just to show that we now have an environment with two VMs on the private Neutron virtual network that spans two hypervisors. When we first issue the boot requests, the status of each VM was BUILD. Once the VM is running on the hypervisor, it will switch to the ACTIVE status. Now let’s verify that the network seems to work as we expect. In this environment we can connect to the private Network from ovn-devstack-1. We can start with a quick check that we can ping both VMs and also that we can ping from one VM to the other. PING 10.0.0.3 (10.0.0.3) 56(84) bytes of data. Now let’s take a closer look at what OVN has done to make this work. We looked at the OVN_Northbound database earlier. It now includes the two additional ports for the VMs in its configuration for the private virtual network. When we requested a new VM from Nova, Nova asked Neutron to create a new port on the network we specified. As the port was created, the Neutron OVN driver added this entry to the OVN_Northbound database. The northbound database is the desired state of the system. As it gets changed, the rest of OVN gets to work to implement the change. OVN has a second database, OVN_Southbound, that is used internally to track the current state of the system. The Chassis table of OVN_Southbound is used to keep track of the different hypervisors running ovn-controller and how to connect to them. When ovn-controller starts, it registers itself in this table. As logical ports get added to OVN_Northbound, the ovn-northd service creates entries in the Binding table of OVN_Southbound. This table is used to keep track of which physical chassis a logical port resides on. At first, the chassis column is empty. Once ovn-controller sees a port plugged into the local br-int with an iface-id that matches a logical port, ovn-controller will update the chassis column of that logical port’s Binding row to reflect that the port resides on that chassis. Another function of the ovn-northd service is defining the contents of the Pipeline table in the OVN_Southbound database. Each row in the Pipeline table represents a logical flow. ovn-controller on each chassis is responsible for converting the logical flows into OpenFlow flows appropriate for that node. We will go through annotated Pipeline contents for the current configuration. The output has been reordered to make it easier to follow. It’s sorted by datapath (the logical switch the flows are associated with), then table_id, then priority. The Pipeline table has a similar format to OpenFlow. For each logical datapath (logical switch), processing starts at the highest priority match in table 0. A complete description of the syntax for the Pipeline table can be found in the ovn-sb document. Table 0 starts by dropping anything with an invalid source MAC address. It also says to drop anything with a logical vlan tag, because there’s no concept of logical vlans. The next 5 rows correspond to the five logical ports on this logical network. If the packet came in from one of the logical ports and its source MAC address is one that is allowed, processing will continue in table 1. Finally, if the packet did not patch any higher priority flows, it just gets dropped. The highest priority flow in table 1 matches packets with a broadcast destination MAC address. In that case, processing continues in table 2 several times (once for each logical port on this network) with the outport variable set. The next 5 flows match when the destination MAC address is a MAC address assigned to one of the logical ports. In that case, the outport variable gets set and processing continues in table 2. Table 2 does nothing important in this environment. It will eventually be used to implement ACLs. In the context of Neutron, security groups will get translated into OVN ACLs and those ACLs will be reflected by flow entries in this table. Table 3 is the final table. The first flow matches a broadcast destination MAC address. The action is output;, which means to output the packet to the logical port identified by the outport variable. 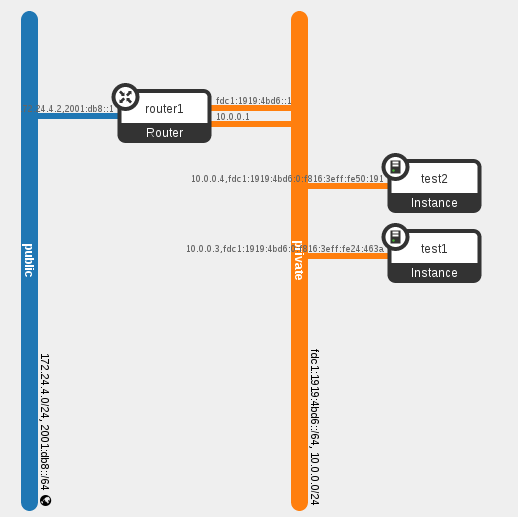 The following 5 flows are associated with the 5 logical ports on this network. They will match if the outport variable matches a logical port and the destination MAC address is in the set of allowed MAC addresses. All of the flows above are associated with the private network. These flows follow the same pattern, but are for the public network. Part of the configuration for ovn-controller is the integration bridge to use for all of its configuration. By default, this is br-int. Let’s start by looking at the configuration of br-int on ovn-devstack-2, as it is a bit simpler than ovn-devstack-1. The port tap10964198-b2 is the port associated with VM running on this compute node (test2, 10.0.0.4). The other port, ovn-b29ae3-0, is for sending packets over a geneve tunnel to ovn-devstack-1. Now we can look at the configuration of br-int on the other host, ovn-devstack-1. The setup is very similar, except it has some additional ports that are associated with the default Neutron setup done by DevStack. 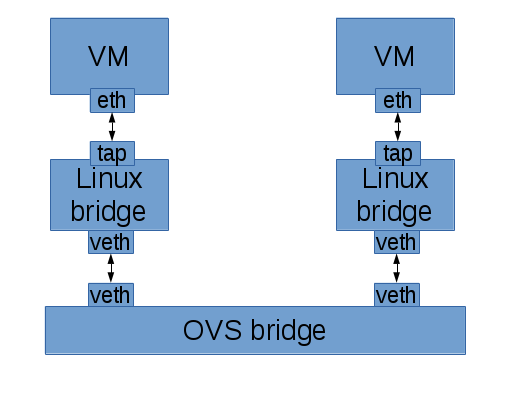 ovn-controller on each compute node converts the logical pipeline into OpenFlow flows. The processing maps conceptually to what we went through for the Pipeline table. Here are the flows for br-int on ovn-devstack-1. The OpenStack integration with OVN still makes use of the L3 and DHCP agents from Neutron. We expect that functionality to be implemented in OVN, instead. As its available in OVN, we will expand the Neutron integration to make use of it. Support for Neutron security groups is not yet fully implemented. The plan is to use some brand new OVS conntrack functionality, which should offer much better performance as compared to how security groups are implemented with Neutron today using iptables. This functionality is targeted at the next OVS release (2.4). My understanding is that the code has been working for a while and is just working its way through the review process for both OVS and the upstream Linux kernel. We have some initial CI testing in place. It installs OpenStack with OVN and makes sure it can all start up and accept the default configuration done by DevStack. We just turned on a new job that runs the tempest test suite but haven’t started working through making it pass correctly. Once the tempest job is passing successfully, I would like to look into a test configuration that uses 2 nodes so that we can regularly exercise the use of tunnels between hosts running ovn-controller.